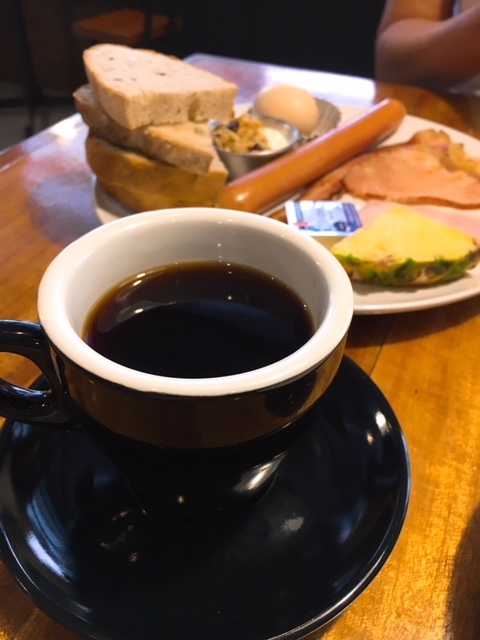 It’s hard not to like everything at Roast Factor Glee, especially when the café owner makes her own breads, pastries, cakes, jams, roasts and grinds her own coffee and is the barista as well. So when you talk about artisanal anything, you have to hand it to Tan Shyue Chin. 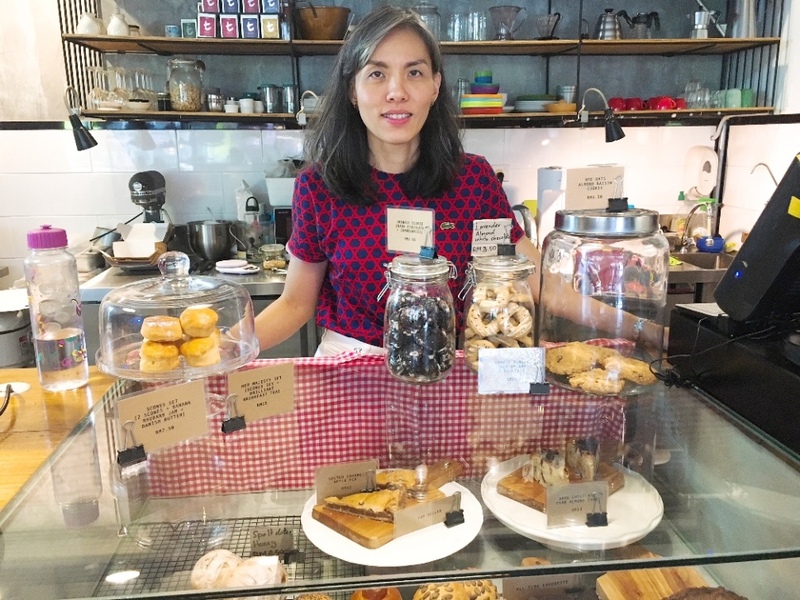 She has been running this café in Bukit Utama, Bandar Utama for the past three years. I was at Roast Factor Glee in its first year, when the menu was limited, and have been back a couple more times since. 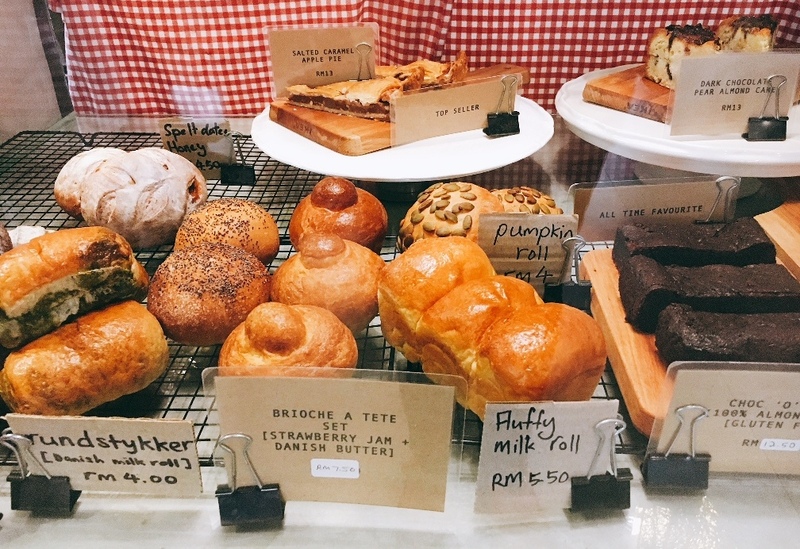 Her café menu has since expanded, her range of breads has widened and you can opt for a bread alert on your phone as they come out of the oven at 3pm every day. Well, I need a pancake alert, after being told they had run out of Mom’s Pancakes, a weekend special, at 12pm! We had been looking forward to “fluffy pancake with bacon bits, smoked streaky bacon, strawberry-tomato artisanal jam and honey drizzle”. 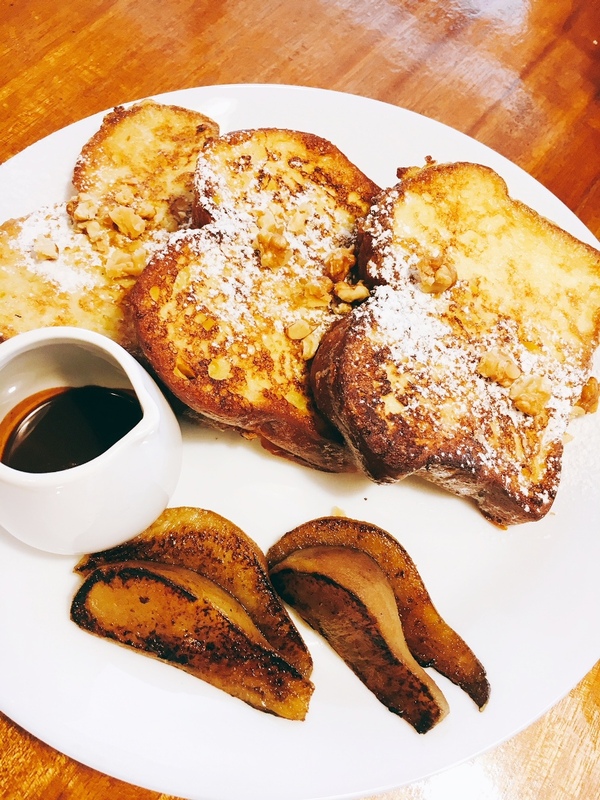 Shyue Chin recommended the Brioche French Toast, with brioche slices dipped in egg and fried with butter, sprinkled with toasted walnuts and served with pear caramelized with balsamic and espresso chocolate sauce. The Glee Factor was certainly there. The light, buttery brioche drizzled with the chocolatey sauce with a hint of coffee was delectable; the sweet pear slices gave it perfect balance. As Roast Factor Glee is an all-day breakfast café, the RFK Big Brekkie, Scandinavian style, is a must. 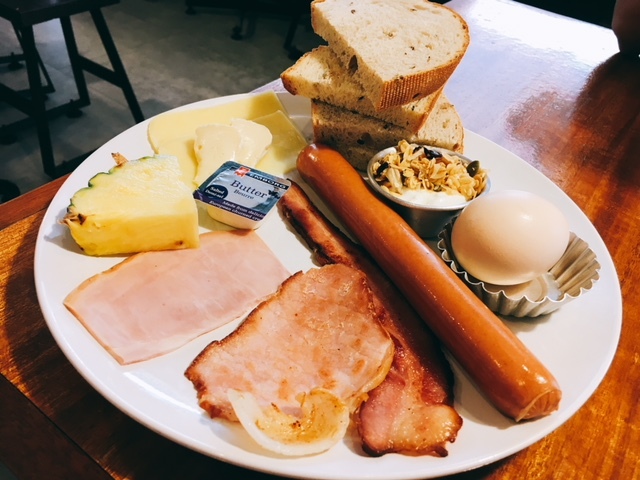 It offers soft-boiled organic egg, pork sausage (made to order by the owner), smoked back and streaky bacon, French ham, pineapple slice, muesli, Danish brie and cheddar and artisanal bread. It s a hearty breakfast and I especially liked the pork sausage and sourdough bread. In between we were introduced to coffee – Hario V60 for the Ethiopia Yirgacheffe Idido , Ethiopia Aricha and a Honduras flat white. The first is a pour over with the buono kettle that glides through the coffee grind. There was satiny mouthfeel with this light, nice coffee, with tangerine and lily fragrance and cacao nibs aroma. The Aricha was more intense with a bitter aftertaste, and hints of pecan and chocolate. Guided by Shyue Chin, who used to live and worked in Panama where she fell in love with coffee, we tried to catch the aromas and flavours she mentioned with each coffee. Back to food. The Cheese Pizza with mozzarella, cheddar and brie was recommended : of course the pizza base is made on-site. 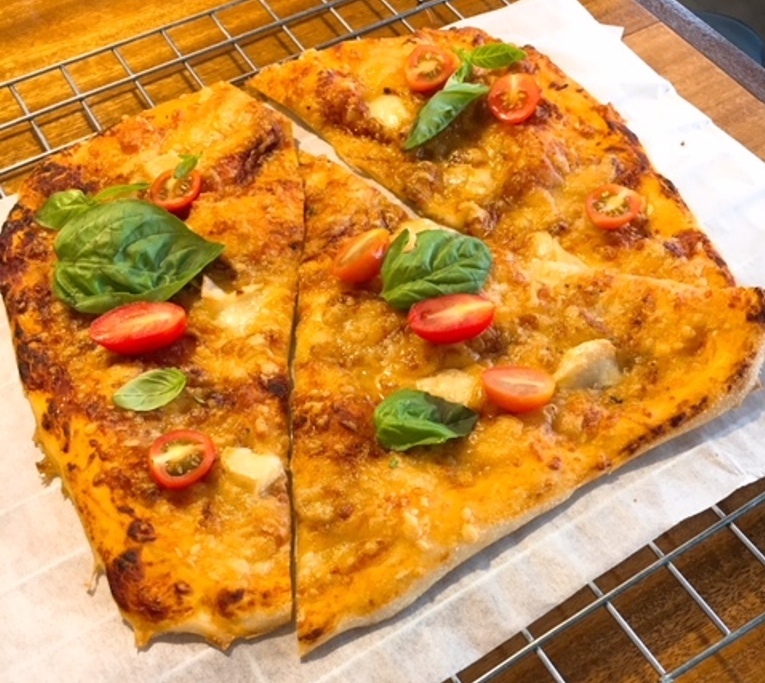 The thin crust was crispy and slightly chewy due to the fermentation but so good with the cheeses, cherry tomatoes and basil. I couldn’t stop eating the Roasted Carrot Salad. 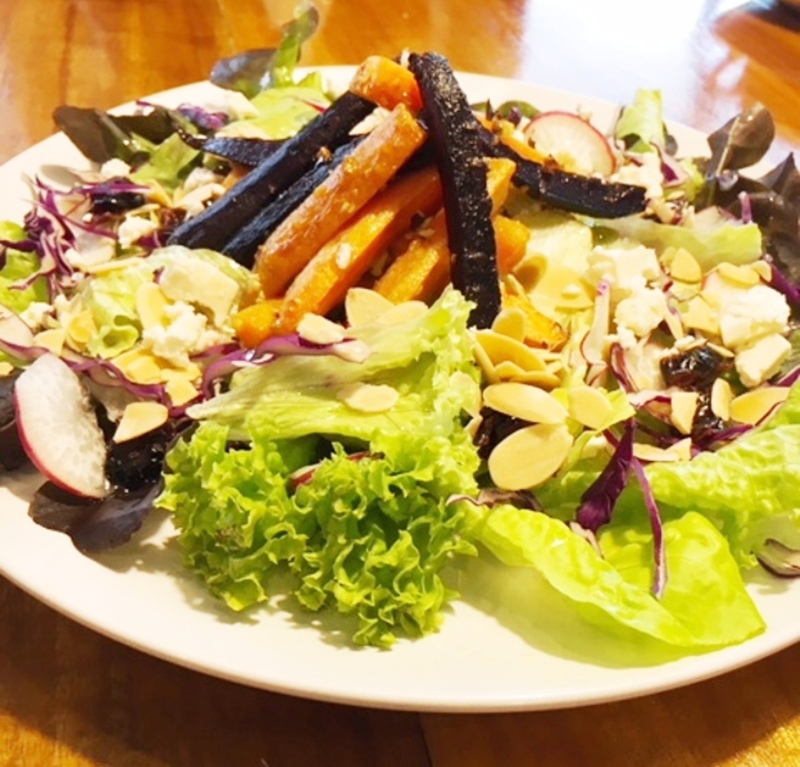 It had naturally sweet Australian and purple roasted carrots resting on lettuce, baby radish, purple cabbage, and combined with almond flakes, cranberries and feta cheese. The dressing is honey and vinegar. This salad is both delicious and healthy. I had a taste of the excellent Frikadeller or Danish meatballs made with minced pork and beef and doused in a luscious tomato sauce simmered for 2 hours with oregano, basil, coriander and bay leaves. You could have these with pasta for a more substantial meal. As for dessert, should we have the Dark Chocolate Cake with tahini and rosemary butter cream, Sticky Date Toffee Cake with Caramel Sauce or the Strawberry Tart? The last is a Danish tea time treat (Shyue Chin’s husband is Danish). 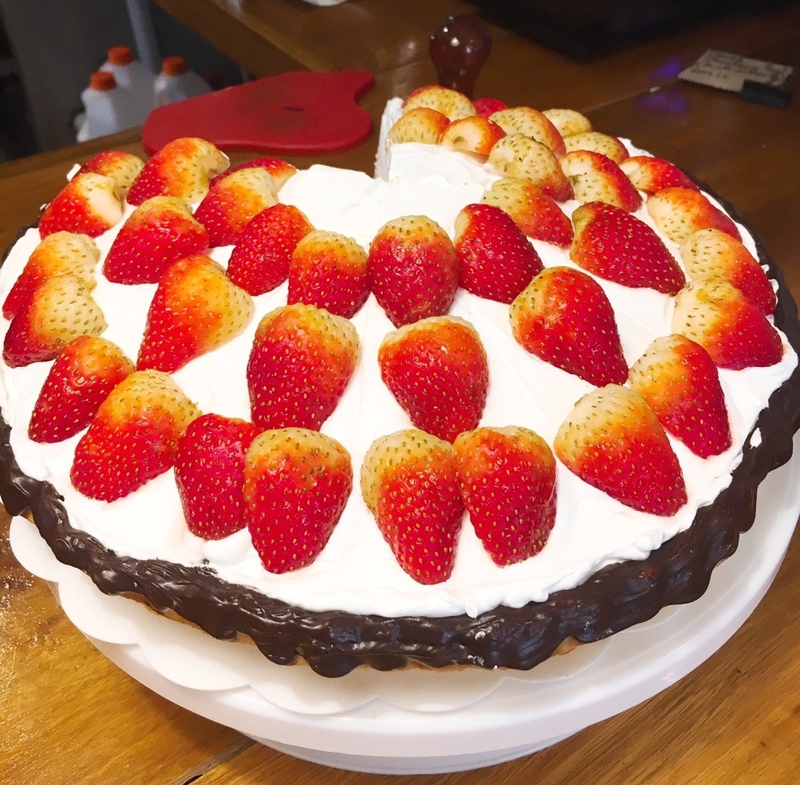 The shortcrust pastry of the Strawberry Tart is layered with marzipan (home-made with 60% ground almonds), Belgian chocolate, fresh vanilla cream and Cameron strawberries. I got sold on the marzipan and though I’m wary of cream, I loved the light, fresh vanilla cream crowned with sweet strawberries. 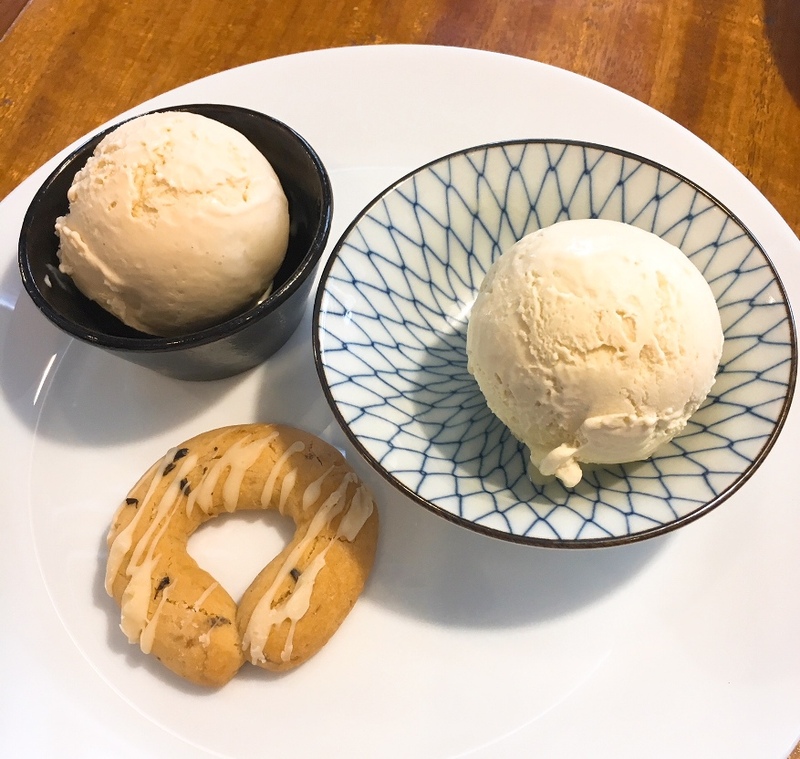 The café has also introduced new ice cream flavours. There’s the sublime lavender ice cream served with a crumbly lavender cookie and the organic buckwheat ice cream. The first is derived from lavender flowers steeped in milk for two days so that you get their natural fragrance. The second has a lovely smoky flavour from roasted buckwheat. It reminded me of “chow mei pang”, a roasted ground rice biscuit. For food that’s mostly made from scratch, prices are reasonable: Roasted Carrot Salad is RM15, Big Brekkie RM30 (add RM5 for a long black), Broche French Toast RM16, Cheese Pizza (half) RM22, cakes are between RM12 and RM13. The café is at G06, Village Shops@The Club, 9 Persiaran Bukit Utama, Bandar Utama, 47800 Petaling Jaya. Tel: 03-7732 2893. The café is open from 8am to 6pm daily, and from 9am to 6pm on weekends. It’s closed on Tuesday.